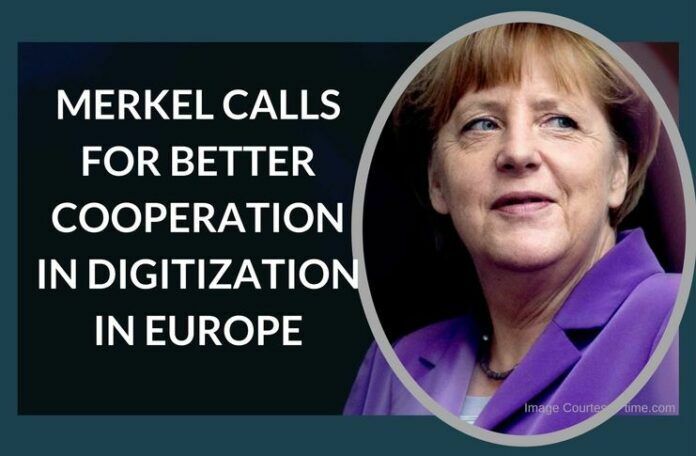 German Chancellor Angela Merkel on Wednesday called for a closer cooperation between the European Commission, the European Union (EU) member states as well as companies in digitization. [dropcap color=”#008040″ boxed=”yes” boxed_radius=”8px” class=”” id=””]T[/dropcap]he German government will do everything to speed up the legislative process at European level and drive forward the digitization, said Merkel before a meeting with French President Francois Hollande, European Commission President Jean-Claude Juncker and managers of large European corporations in the Chancellery. The meeting is the fifth so-called “European Round Table of Industrialists”, of which the main topic this year was the importance of digitalization of all economic sectors. Merkel said, all knew that it’s mainly about the competitiveness and future viability of the EU. “We know that we need to make our contribution, for example, when it comes to the roll-out of the 5G network,” said the chancellor. “In this respect we rely here on a close cooperation between industry, the Commission and our member states,” urged the chancellor. Hollande spoke of a “challenge for growth in Europe, but also for European society”. Given the international competition, the EU must prove that it is able “to develop further”, he said. [dropcap color=”#008040″ boxed=”yes” boxed_radius=”8px” class=”” id=””]W[/dropcap]ith a view to the overall situation in the EU after the referendum in Britain, Merkel also noted that the other 27 member states were aware of their great responsibility, and they are determined to continue the economic development for the benefit of people. Hollande added that the other EU partners would cooperate with Britain, “but on terms that are clearly defined”. Since 2013, Merkel, Hollande and Juncker have met alternately in Berlin or Paris with representatives of the “European Round Table of Industrialists” to answer questions on international companies not only at national level but also at European level. The exchange aims to help to find solutions for innovation and employment in Europe. Previous articleStriking a balance between a minimum standard and the maximum excellence!